Day 1 of my Book(ish) Tour – Sunday the 19th of November – was a very long day. So long, it started at lunchtime on the previous Friday. Beppi’s Restaurant in downtown Darlinghurst has been Mum’s local Italian for over two millennia. She’s been coming here since the 1950’s and is always greeted like the grand dame she is. On this particular Friday, Mum had invited five of us to celebrate many happy returns – two birthdays, two books and all our homecomings. Margaritas were drunk. Sparklers were lit. Things got rowdy. Macca (Ian McNamara) is the host of the ABC radio show Australia All Over. He and his wife / producer Kell (Lee Kelly) were enjoying a meal at the next table – well, trying to enjoy their meal. As our lunch got rowdier we started to spill over into theirs. Finally they asked the waiter to introduce us. I love Macca’s radio show. It’s a stress-free river of personal stories running through Sunday morning. People phone in from around the country to tell him about their world. Dog trials and truck meets. Country fairs and fundraisers. It’s the only place a city slicker is likely to hear about the Oodnadatta mud-maps, or lawn-mower racing at the Bream Creek Show. Jo, gorgeous loving supportive just-like-a-sister Jo Lucas, ran home to get Mum and my books while I introduced mum. She then told Macca and Kell about my journey across America adding that I was about to embark on another into the heartland of Australia. It was all so friendly – especially when they invited me to the ABC studios in Ultimo at 8am on Sunday to talk about it all. Well there’s something I can check off my bucket list – being on Australia All Over. Many happy returns indeed! By 6pm I was bed-ready, but that wasn’t going to happen. Grace Breen, the Marketing and Publicity Manager at Affirm Press, had arranged an interview with Sarah McDonald on her radio show Nightlife. I was due on-air at the stroke of midnight. Suffering jetlag but needing to stay awake I invited a friend, Michele, to dinner and then we went to drinks at a mutual friend’s house nearby. It was raining when we arrived at the party and there was a long walk to the house. Seeing a Wentworth Courier wrapped in plastic, I picked it up to shield myself from the downpour. I looked up and saw my mother smiling benevolently down on me from above. We got to the party about 10pm, and many friendly faces rose from the past to greet us. One surprise was Alan Lowery the original Producer of Simon Townsend’s Wonder World! I hadn’t seen him for (like) 20 (hell, maybe 30) years and I was in full stride of catching up when another familiar face emerged from the party lights. This time from the future. She reacted the same and we fell on each other like long lost puppies. I was so glad Alan was there to witness this most modern of rituals. You see – I only knew Paige from Facebook, and this was our first meeting in the real. It was well passed late by the time I got home, put on my t-shirt on and turned down the bed. (In this case, turned it from a couch into a bed.) When I went to set my alarm I discovered I’d lost my phone. I opened the computer to use the ‘find my phone’ feature – and saw it was outside in the wilds of Darlinghurst. I carried my laptop out into the street, but didn’t have enough wifi-range to make it a block away where it thought my phone was. So I Skyped the Husband in Switzerland, and asked him to ring my phone so I could see it in the dark. I Skyped him again. Turns out he chose not to ring my phone for fear if it was in the street, some passing vagrant might get lucky. “But I’m the only passing vagrant out there” – I whined. He rang the phone, and it glowed on the front seat of my car. Black phone on black seat in the black of night. I set the alarm for 7.30. with a view to getting to the studio in plenty of time for the 8.30 show. I attempted to argue, certain the interview was for 8.30, but then remembered I’m a ditz. Also, I was awake, so I may as well hurry. I parked out the back of the ABC where I’d been 6 hours earlier. I was having difficulty signing in at security when a call came down – they were looking for me in the studio. Mum was right, of course. I was ten minutes late for the interview. I was very sorry to miss ten of my fifteen minutes of fame. Click here for how it all panned out. So a big motivation for this adventure was to put my book in front of readers in the run up to Christmas. I planned to visit as many bookstores as possible and talk to buyers and sellers. Uninvited. Just – turn up. I’d already made a few practice visits, and hoped to visit at least one bookstore, one library and do one bookish thing every day. Today I planned to drive from Sydney to Cessnock and included a list of independent bookstores – some in Sydney: Harry Hartog Bookseller, Lesley Mackay’s Bookshop, the Potts Point Bookshop in the East. Others along the Pacific Highway – Blue’s Point Bookshop , The Constant Reader Bookshop. Then I’d visit Hornsby Central Library before fanging up the freeway to Cessnock. Beyond that, I had no firm game-plan, which means (according to that wise old Chinese philosopher Sun Tzu’s Art of War) I was subject to capture by others. After leaving the ABC studios I bought Mum a bacon and egg sandwich to thank her for getting me out of bed before the interview was over. Then, as is the way with best laid plans – she pointed out 12 bags of soil which had recently been dug out of the corner of her footpath and dumped into her back yard. She wanted, particularly, that I help her remove them. Being a screenwriter, I suspect the subtext here was not the soil – but the short amount of time I had allocated to being with her. I had arrived only a few days earlier and already I was chomping at the bit to leave again. And so I would, as soon as the two of us drove all over Sydney seeking suitably empty bins. Rather than a tour of bookstores, we did a tour of shopping centre garbage bins. Not wanting to abuse any one council – we drove from Coogee to Bondi via Randwick and Paddington. Stopping from time to time to deposit one single shopping bag of soil. I thought we hit the jackpot when I found a skip with a loose tarpaulin (which could well be a metaphor for my state of mind.) But no sooner had I unloaded the sacks of dirt – than an elderly gardener approached with his iPhone drawn. He was taking photos of me and my car license plate. He would brook no excuse. I had to remove all the dirt or he’d report me to the police. The sense of injustice that his skip was occupying three parking spaces was strong. But since others had been dumping into the open skip there was a very real risk I’d end up with more bags of dirt than I started with. In the end, I returned the sack of dirt to the boot of my car and drove off. Garbage bin by garbage bin we eventually got rid of the dirt. We dropped in for a farewell drink with friends, and then I dropped mum home where she ducked inside – only to return carrying her one, perfect, gardenia – plucked and placed in a cigar tube of water. A parting gift for me. The lovely white flower fitted sweetly into the cup holder of my car. We kissed and hugged. I got into the car and tuned the radio to a classical station. As I waved her goodbye I started to wonder where a 90 year old woman finds a cigar tube. Finally I was free. I had three hours of light, and an hour’s drive ahead of me. Tonight I’d be sleeping over at my cousin Kimmy’s house. She has two clear distinctions in my life: 1) As children she spent hours of our school holidays teaching me to read. 2) She was an early reader of my book – taking chapters of the final draft and giving me encouraging feedback as I wrote. Writing is a long haul job and it can get lonely, so it was precious to have someone eagerly waiting for my words. Her enthusiasm kept me going during the long haul of the sixth rewrite and now – here I was, driving to a copy of the final work to her. This was a great moment in the journey of the book, and I was excited as I entered the Pacific Motorway. 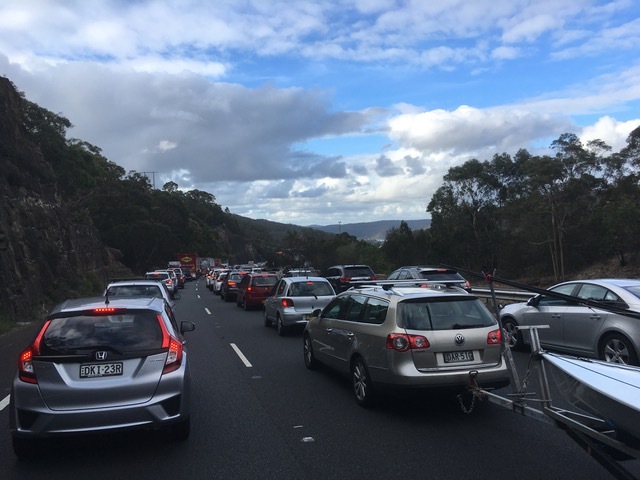 On the radio, a caller phoned in to say a pantechnicon truck had jack-knifed and was now blocking all three lanes of the freeway travelling north. This was bad news, but also a rare moment of perfection: I had the radio on; I heard the news; I heard it in time to pull off and take the old Pacific Highway. Better, my stop at the library meant I was well clear of the actual accident. Win / Win. I pulled off the freeway, bought some petrol and started driving towards the Pacific Highway. I soon came to a fork in the road – and, following all the instructions – re-entered the motorway! After several hours and 30ks of jammed traffic I arrived at my cousin’s house well after dark. I fell out of the car in a flurry of chip wrappers and water bottles. She greeted me with a glass of champagne and a tour of her new home. It was heaven to see her, but what should have been a leisurely evening catching up turned into a hurried meal and as early to bed as possible. I had a 5am start the next day.